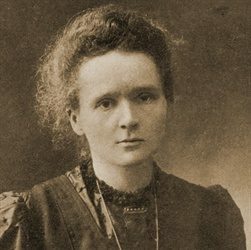 “On this day in 1911, Polish-French physicist and chemist Marie Curie became the first person to be honoured with two Nobel Prizes. The fifth and youngest child of teachers Bronislawa and Wladyslaw Sklodowski, Curie was born Maria Salomea Sklodowska in Warsaw, Russian Poland. After completing her schooling and working for some time as a governess, in 1891, she traveled to Paris to study physics and mathematics at the Sorbonne. There, she found a scientific collaborator, and love, in Pierre Curie, a professor of physics. They were soon married and often worked together. In 1896, Curie’s doctoral advisor, Henri Bacquerel, discovered uranium salts emitted rays that behaved like x-rays in their penetration. Curie investigated the uranium rays and discovered that the uranium atom itself generated radiation. Aided by her husband Pierre, she also discovered other minerals that generated radiation, including radium and polonium, named after Curie’s native Poland. In 1903, Marie and Pierre Curie, along with Bacquerel, were awarded the Nobel Prize in Physics, which they shared. Curie was the first woman awarded a Nobel Prize, the first person to be awarded a second Nobel Prize, and the only one to be honoured with a Nobel Prize in two different sciences. She developed methods to separate radium from radioactive residues and recognised its therapeutic properties. As such, she promoted its use in World War I to treat injured soldiers. Caption: Marie Curie is widely celebrated for her seminal advances in physics and chemistry.